Fed up with mediocre Wi-Fi on the road? For not-so-frequent travelers, a pay-as-you-go personal hotspot might be the answer. We put five to the test. On a recent trip to Philadelphia, I paid my hotel $14 a night for spotty Wi-Fi access that topped out at a mere 2Mbps and often stopped dead in its tracks. I was constantly waiting for emails and small files to download to my laptop, and video streaming was, to put it charitably, less than smooth. Unfortunately, this seems to be the norm these days: Hotels are charging for Wi-Fi service that's mediocre at best. There is a better way, and it involves bringing your own mobile network with you. "Having a personal hotspot can let you connect at office speeds just about anywhere," says Jeff Kagan, an independent wireless analyst. "It can mean the difference between being online and off." Why get a personal Wi-Fi hotspot (and have one more thing to carry, charge and potentially lose) when your smartphone can operate as a hotspot? Because using a phone as a hotspot can chew through the battery in a very short time, and when you want to collaborate with others, it's often limited to only a few users at once. A personal hotspot, on the other hand, can provide online access to eight or ten participants at a time -- perfect for an offsite meeting, even on a train or in a van. Traditionally, a mobile hotspot requires a two-year contract and a monthly data plan -- which makes sense only for those who travel several times a month. For others who travel less frequently, it can end up being expensive and wasteful. That's where a prepaid hotspot comes in. You're not locked into a two-year commitment with a service plan that you pay for every month whether you need it or not. A prepaid plan lets you add data into your account and use it as needed (although the plans vary among the service providers). I took a look at five of the latest mobile hotspots that connect over the major national networks with prepaid services. They include, from the major networks, AT&T's Unite Express, T-Mobile's 4G LTE HotSpot Z915 and Verizon's Ellipsis MHS800L. There are also the Boost Netgear Fuse Hotspot and the Karma Go; Boost and Karma are Mobile Virtual Network Operators (MVNOs) that buy connect time on Sprint's networks. The five hotspots range in price from $50 to $149, have a wide variety of plans available and offer a range of sizes, features and online performance. "Picking the right hotspot to get is not a simple decision," says Kagan. "You need to look at the entire connection landscape, which also includes the network's technology, hotspot hardware and service plans available." His advice is to first pick the network that suits your travels geographically, because even the best online device is worthless if there's no network where you need it. I recommend starting at the carrier's website to see if they operate in the general area you want. Then, go to OpenSignal's crowdsourced coverage maps and zoom in on a few places you think you'll be traveling to see in detail if the carrier's service is good. Finally, you'll need to pick the service plan that best matches your needs. Don't worry, it's a lot easier to up- or downgrade your prepaid hotspot service plan than with a traditional hotspot or phone plan. Each network has a different view of how data access should be structured. Karma, for instance, offers data for no set time period; just add more data when you need it. By contrast, AT&T still requires a monthly data budget for prepaid plans, but you can turn it on and off as your travel plans change, as well as add data at any time. While this might be confusing, we're here to help with a lab test drive that attacks this issue from three sides. I compared the prepaid plans available with each device, focusing on price and flexibility. I took a look at the hardware, noting size and weight and testing the devices' battery life and Wi-Fi range. And I did extensive testing of the 4G networks that they operate on by connecting the five hotspots to everything from a Windows PC and a Mac to Android devices and iPads in 20 separate locations over a six-week period. One caveat, though: The network testing was performed on the east coast, from New Jersey to Maine, where even the flimsiest 4G networks are the strongest. Your experience may be different, particularly if you live in the plains or mountain states. But one thing is certain: With a personal hotspot along on your next trip, chances are you won't have to suffer with a hotel's dismal Wi-Fi service. 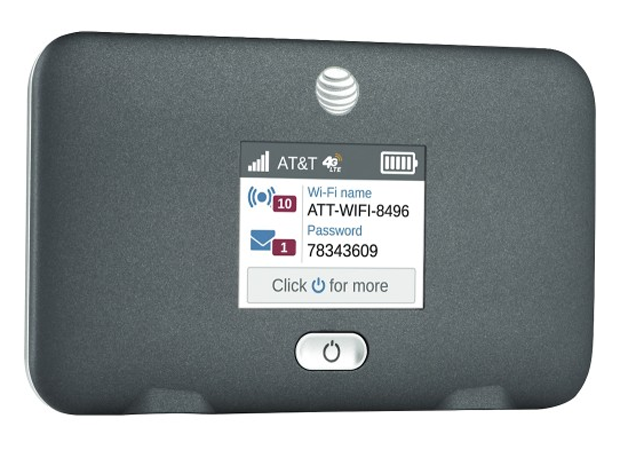 It may not be the smallest or longest-lasting hotspot, and it is far from the easiest to set up prepaid service for, but AT&T's Unite Express delivers the hotspot goods. It connects over a reliable and wide-ranging 4G data network, putting data where it's needed: on your screen. Measuring 4.4 x 2.7 x 0.6 in. and weighing 4.5 oz., the black Unite Express is near the high end of the size and weight spectrum for hotspots but still significantly smaller and lighter than T-Mobile's Z915. It easily fits into a jacket pocket. If you look carefully, the Unite Express bears more than a passing resemblance to the Boost Fuse hotspot. Both come from Netgear and match each other's spec sheet; the biggest difference is that the Boost Fuse has a glossy finish and AT&T's Unite Express has a soft rubberized coating. Like the others, it's charged via a micro USB port and, unlike the Karma Go, includes an AC adapter and cable. It also has a pair of ports for external antennas (sold separately) for when reception really counts. In addition to an on/off button, the Unite Express has a 1.7-in. color info screen that shows the battery charge level, signal strength and whether it's connected to a 4G network. It doesn't show how much data has been used, which the Boost Fuse does. 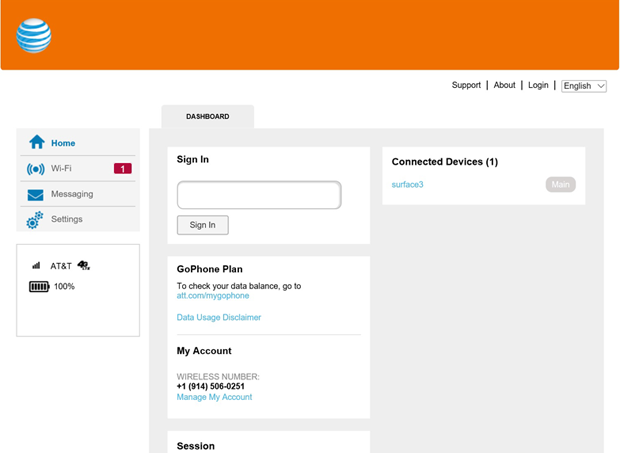 To see how much data you have remaining, you'll need to type att.com/mygophone into the Web browser of a device that's connected to the Unite Express. You'll also find a slew of configuration details and options, including the Wi-Fi network name and encryption passcode, as well as a link to refill your data account. Everything from your phone number to settings and a link to your account balance are on the Unite Express hotspot's Web page. AT&T then sends an email with a temporary password for the hotspot, which shows up on its screen. Finally, you'll need to change the password again to something of your choosing. All told, it's a 15-minute process, versus a few minutes for most of the others. Inside the Unite Express is an 802.11n router that supports WPA2 encryption and works with as many as 10 clients at a time. In my tests it had a disappointingly short 75-foot Wi-Fi range. On the other hand, it lasted a reasonable 8 hours and 35 minutes on battery power -- 15 minutes short of the similar Fuse's run time and one third shorter than the Verizon Ellipsis Jetpack's 12 hours and 45 minutes. Like Verizon, AT&T has an extensive LTE network with a profusion of cell sites on both coasts and many in the middle as well. It covers places like Coeur d'Alene, Idaho, which others don't. If the 4G network isn't available, the fallback is AT&T's 3G network, which is more extensive but much slower. 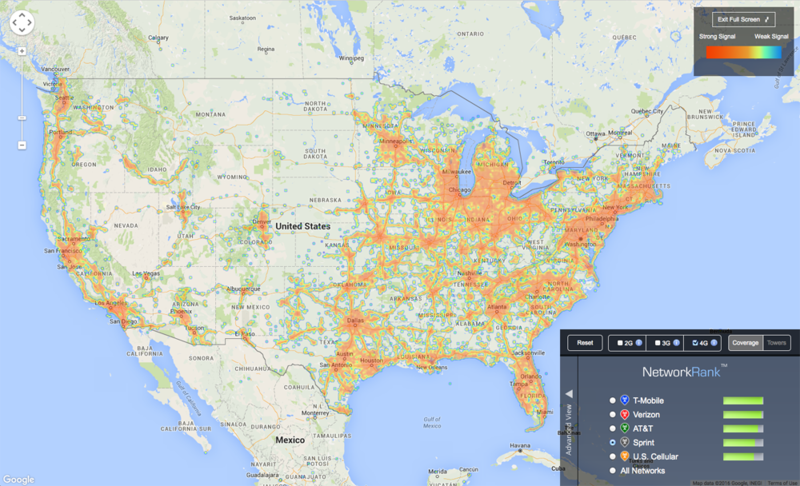 AT&T's U.S. LTE network as mapped by OpenSignal. The hotspot that best combines network service with hardware capabilities, the Unite Express had a clean sweep of the network performance tests. Its 45.7ms latency represented about half the wait-time of T-Mobile's network. Its peak upload speed was 15.7Mbps, and it had an average upload speed of 10.2Mbps. That's well ahead of the Verizon and T-Mobile units, and several times the speeds that Sprint delivered via the Boost and Karma devices. Its download speeds averaged 15Mbps and peaked at 28.8Mbps, a few megabits per second faster than T-Mobile and Verizon, but at least double that of the two Sprint network hotspots. This should be plenty for a group of workers sharing a Web connection. Price: $80 for hardware; plans range from $25 (2GB) to $75 (8GB)/mo. 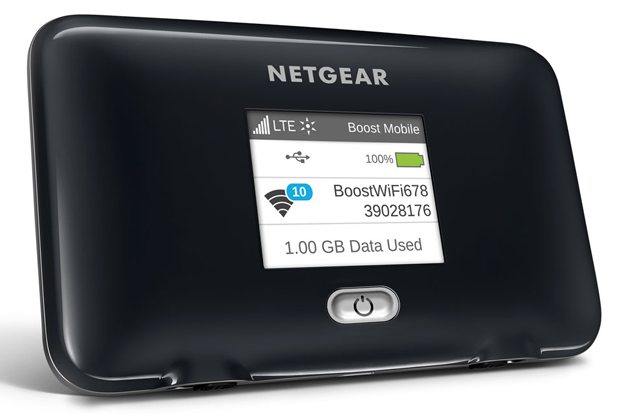 While Boost's Netgear Fuse Mobile Hotspot is inexpensive and offers the cheapest data plans of the five, the Sprint network that Boost piggybacks on falls short of the mark in terms of geographic reach and performance. The Fuse hotspot matches AT&T's Unite Express in most areas, except it has a shiny finish, compared with the Unite Express's matte texture. Other than that, they both weigh 4.5 oz., measure 4.4 x 2.7 x 0.6 in. and are only slightly smaller than T-Mobile's Z915 hotspot. The Boost Fuse is charged with an included micro USB AC adapter and has a pair of ports for external antennas (not included) to help grab a weak signal from a distant cell tower. Netgear sells an AC-powered desktop cradle that has antennas built in for use in a trailer or other remote location. Like the Unite Express, the Fuse has a 1.7-in. color display, but the info it offers is more extensive. The Fuse not only shows the expected signal strength and battery status, but how much data you've used. Granted, showing how much remains in the account would have been more useful, but it's a big step up from the competition. 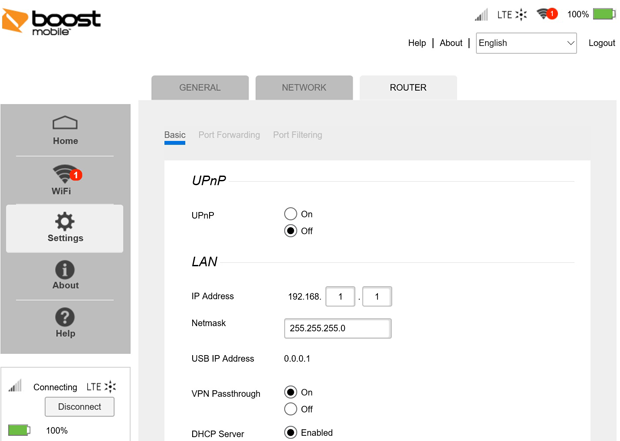 The Boost configuration pages load automatically when you open a browser that's connected to the hotspot, saving you from having to type in an IP address. In addition to how much data has been used and what remains, you can see who's online, set up port filtering and change the unit's name and password. 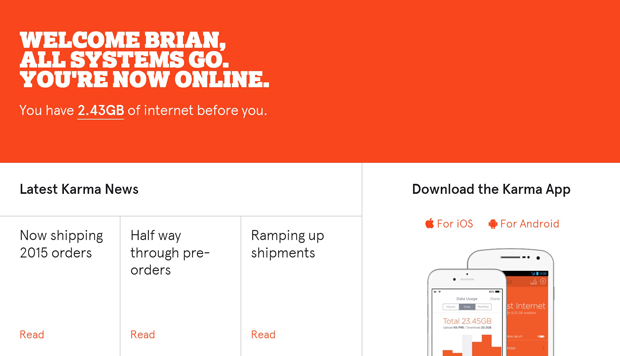 Boost's settings site lets you configure the hotspot and shows info such as the battery's charge level. The Fuse can also be used with Netgear apps for iOS and Android tablets and phones. They let you see what's going on and make changes to the hotspot's configuration. Setup takes about five minutes and starts with connecting the Fuse to a client. It comes with a unique network name and encryption passcode, so is secure out of the box, but I recommend changing them as soon as the device is online for better security. After clicking on Activate Now, you need to set up an account and enter your credit card info. (Boost won't take PayPal or Bitcoins as payment.) After connecting to Boost's servers and picking the rate plan, you're online. Like the others, the Fuse has a full 802.11n router inside; it supports WPA2 encryption and can connect with up to 10 users at once. Its 80-foot Wi-Fi range was short, just five feet longer than the similar Unite Express device. Still, it should be more than enough for a group in a small conference room. Like the Karma Go, the Boost Fuse uses Sprint's 4G network, which has lots of cell sites on the east and west coast, but is sparsely covered in the plains and mountain states and lacks Canadian and Mexican coverage. That said, Sprint has been working to expand its network and upgrade its LTE technology. Sprint's U.S. LTE network as mapped by OpenSignal. Surprisingly, the Fuse's performance results don't mirror those of the Karma Go, despite using the same network. It had peak download and upload speeds of 17.6Mbps and 13.6Mbps, compared to 32.7Mbps and 26.4Mbps for the Karma Go. That said, the Fuse's average download speed of 5.9Mbps was nearly 30% faster than Karma Go's 4.2Mbps average, while still disappointing compared to AT&T's 15Mbps average download speed. The performance was reversed for average upload speeds, with the Fuse pushing just 2.9Mbps up to the cloud -- more than 40% slower than the Karma Go's average 5.1Mbps upload speed over the same network. In fact, there were times when the two devices gave wildly different results while operating side by side. The Boost Fuse's 48.9ms latency was second best to the AT&T Unite Express's 45.7ms, well ahead of the Karma Go's latency of 79.9ms and the T-Mobile Z915's 90.4ms. Its price tag of $50 makes the Fuse a bargain. Boost offers only monthly rate plans that range from $25 for 1.5GB (not as good a deal as AT&T's $25/2GB plan) to $50 for 10GB (much better than AT&T's $75/8GB plan). Unfortunately, the data expires when the 30-day time period expires. Boost's Fuse is for those who travel where Sprint has service and who have high data needs. Price: $50 for hardware; plans range from $25 (1.5GB) to $50 (10GB)/mo. The Karma Go is unlike any other hotspot -- it actually encourages you to share your data stream with others. This may show generosity, but it may not suit security-minded business travelers, especially because it doesn't encrypt its data stream. At 2.9 x 2.9 x 0.5 in., the Karma Go has heavily rounded corners, making it look like a white hockey puck and allowing it to easily fit into a shirt pocket. It weighs 2.8 oz., making it slightly heavier than the Verizon Ellipsis Jetpack MHS800L and a couple ounces lighter than T-Mobile's 4G LTE HotSpot Z915. On its edge are an on/off button and a micro USB port for charging. While it comes with a short charging cable, the package doesn't include an AC adapter. It's the only one of the five to lack this essential piece of equipment, although you can buy a generic one for about $5. Visually, the Karma Go stands out because it does without the info screen that the others have. Instead, the Go has a series of small circles on one edge that convey what's going on inside. The three open circles act as a signal-strength meter, lighting up in white to show how strong a link to the Sprint data network you have. On the right is a colored-in circle that acts as a battery gauge, glowing green for a full charge, orange for 67% charge, red for 33% remaining and white when the device is asleep. To get going, connect the Karma Go via Wi-Fi to a Windows, Mac OS X, iOS or Android client using the "Karma Wi-Fi" network name. You'll need to create an account and enter credit card details; Karma also lets you pay with PayPal and even Bitcoins. New accounts get an instant 100MB of data. Setup took me seven minutes from start to finish. Getting confirmation for Karma service. If you're using a laptop, the Go connects you to a Web page; if you're using a phone or tablet, you'll need to get a free app for iOS or Android. Using the website or the app you can see things like how much data you've used, how much remains and your history of data usage; you can also pay for more data. However, the site and app lack a battery gauge and details like how many clients are connected. While it is a full 802.11n router that accommodates up to eight users, the Karma Go's Wi-Fi connection with the computer isn't encrypted. By design, this allows and encourages others to jump on and use your connection (they'll see it listed among the available Wi-Fi networks), but not your data stash. Needless to say, this is an open-minded attitude that could (potentially) lead to your computer being compromised. However, Karma says that each client's data stream is isolated and that there have been no reported instances of using a Karma Go to hack into a host's system. Personally, I found it felt liberating and acted as a natural conversation starter to share the data connection with a stranger, and I didn't experience any slowdowns while sharing the connection. Karma gives you an extra 100MB every time you share your Go's connection. The Go puts out the strongest Wi-Fi signal of the bunch with a superb range of 110 feet -- 35 feet longer than the AT&T Unite Express. On the downside, its battery lasted for just 4 hours and 35 minutes, the shortest of the five and only about a third as long as the Verizon Jetpack's 12 hours and 45 minutes. The Karma Go uses Sprint's emerging LTE network, and -- as is the case with Boost -- that's a weak point. The network is strongest on the east coast and Midwest, but is sparsely represented throughout the plains states and offers no sites in Mexico or Canada. 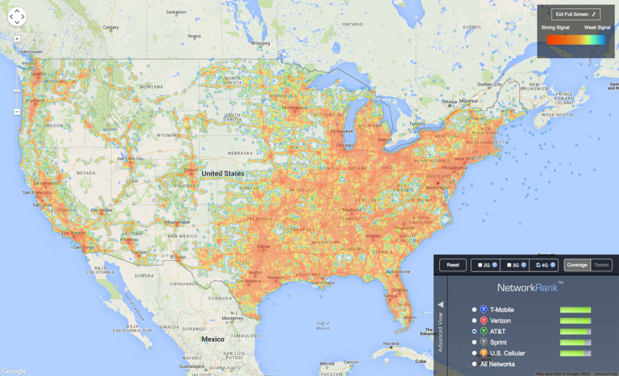 If there's no 4G coverage, the Boost device will use Sprint's older and slower 3G network. In actual use, the device was reliable and never failed to connect on demand. It hit peak download and upload speeds of 32.7Mbps and 26.4Mbps at different locations on different days. In testing, however, the Karma Go was a mediocre performer with an average latency of 79.9ms, 43% slower than the class-leading AT&T Unite Express. Its average download speed of 4.2Mbps made it the slowest of the five. Oddly, its average upload speed of 5.1Mbps was faster than its average download speed -- and faster than the average upload speeds of both the Boost Fuse (2.9Mbps) and T-Mobile's Z915 (3.1Mbps). Think of the Karma Go as the social butterfly of the hotspot world. At $149, it's nearly three times the cost of the Boost Fuse or the Verizon Ellipsis Jetpack, but can help make friends while delivering data.